When you are not near the coffee shop for that strong espresso coffee, the next best option is to invest in an affordable machine and learn the brewing process. 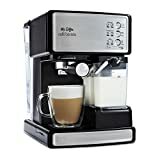 That is why I have the best espresso machine for under $200 reviews to help you select another kitchen companion. Since the price of an espresso machine can make you think of other options, what you will see below is a guarantee that there is still hope. The choices on board have more to offer since most of them make more than the espresso. If you want to match what you get from your favorite coffee seller, read the reviews below and see which one blows your mind. And here’s the longer version, go grab your favorite coffee and read on. At the top is Mr. Coffee Café Barista machine which comes with a 3-in-1 specification. That means you can make cappuccinos and lattes if you don’t need an espresso to kick-start the day. At under $200, it is indeed affordable, but some of us would ask at what cost. 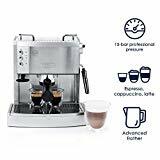 Well, the benefits stand for a 15-bar pump system to brew the richness out of your ground coffee, a frother for the milk foam and easy to reach control panel when you want to select your drink. The water reservoir is large and removable when need be. After using the machine, the auto-switch feature will shut it down after 9 minutes of idleness. When you taste the first espresso cup and feel something is not right, it means you did not follow the instruction manual. It directs you to prime the unit before first-time use. You can complement it for other drinks after that, but the espresso seems lighter than usual due to the amount of water drawn from the grind. The only thing you might question about is its durability since most of the parts are plastic. On the other hand, if properly used, it will stay at home for quite a long time. 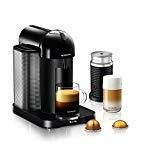 Another espresso machine to help you start brewing your coffee beverages is the Nespresso Inissia made by De’Longhi. It is small and portable unlike what you would expect from an espresso maker. What makes the customers rejoice more is that the size does not compromise the espresso coffee quality. For a starter, that’s a good thing. Hot water is delivered via 19 bars of pressure which is unbelievable considering the size. However, Nespresso does not stop there. With this equipment, you don’t need to wait until the water is hot for you to prepare your coffee. Whether you want a 1.35oz espresso or a 5oz lungo, just hit the relevant button and Inissia will pour the coffee after heating water for 25 seconds. The amount of cups it makes is also something worth noting. You get nine single-serves before refilling the 24oz water reservoir. If you need some froth for the cappuccino or topping the latte, there is an Aeroccino 3 milk frother for that. Energy efficiency is essential – a reason why the coffee brewer will switch off after 9 minutes of not using it. Do you want a bigger cup of diluted coffee after making the espresso? The drip tray is foldable to accommodate the mug sizes. The only disadvantage here is that you will have to use the Nespresso capsules henceforth. To counter that, they include a package to start with before you know where to get more supplies. De’Longhi is a renowned brand in the coffee industry, and whether cheap or expensive, they will always deliver. That is why I feature the EC702 Espresso Maker in this review. If you choose to buy it, know that it comes with a manual frother so there will be a learning moment after it arrives. Next, it has independent thermostats for steaming and brewing. When you need to switch between the functionalities, the temperature remains the same. You, however, have to wait for it to heat before the signal appears on the control panel. Better extraction is a gift from the 15-bar pressure system, but you have to tamper your coffee correctly for the best brew. The plastic tool for that is quite weak, so you have to improvise. Despite the above, the portafilter allows for single or double shot filtration, and it works with pods too. 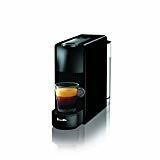 You can choose to use it for the espresso or other beverages including entertaining guests with coffee shots. There are complains about the steam wand not reaching beneath the portafilter, and while that’s an issue, it can be detached when you need to clean it. The machine also feels light due to most parts being plastic. If it moves, especially when dealing with the portafilter, holding it at the top will make it steady. 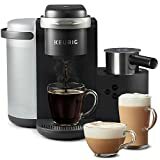 It is debatable on whether the Keurig K-Café Single-Serve can brew espresso coffee since the taste from a single brew dedicated machine never falls short of glory. Anyway, you get one cup full of riches from the K-cup pods, and you have the option of making the lattes and cappuccinos at will. Using a Keuring is simple since the buttons are straight forward. After heating water, the shot button is all you need for that dark brown solution. An attractive feature from this machine is the froth which is set apart from the rest of the body. If you don’t get the foam out of it, make sure you cover it with the lid first before thinking about returning it. You can brew different cup sizes – 6, 8 and 10oz sizes and when you need a bigger cup, the drip tray is removable. The water will still be available until you brew the sixth cup since the reservoir holds 60oz. One of the problems that you have to face is getting Keurig compatible cups. 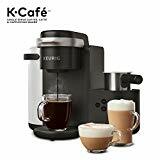 That excludes K-Carafe, K-Mug, Rivo and Vue pods still from the same brand. The other issue is about the unit discharging water when you turn it on. If you are facing it, that means you are using purified water. Solving it needs you to use a mix of filtered and tap water. 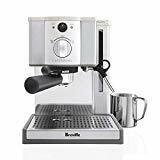 The reasons why Breville ESP8XL Café Roma Espresso Maker lands in most kitchen counters are due to the stainless steel sturdy build and the crema coming out of the filters. First, it has an impressive boiler whose heating block raises questions about its material. While it appears to be a stainless steel heating type, others have judged it to be cast aluminum. The company does not disclose the construction materials, and that’s something worth addressing. On the other hand, it delivers 15 bars of thermoblock pressure to make your espresso at the right temperature. The coffee making mechanism also depends on the dual filtration system to pave the way for better crema. The filters are also stainless steel and patented by Breville to deliver single or double shots and use of pods if needed. You get a rich taste of espresso from ground beans, but that also depends on how hard you tamper the coffee before setting the portafilter. The steam wand is another specification you get to enjoy. It delivers the needed steam, but it would be better if you can control the steam. This one has an on/off knob only. More from the espresso machine includes a removable drip tray and grid which is okay if you want to clean it. There is a warming tray that can heat up to six cups once. The 40.6oz water tank makes sure that you don’t refill the reservoir too often. Lastly, the accessories include a cleaning tool, a frothing pitcher, a measuring spoon and a tampering tool. The Nespresso Essenza Mini model resembles Inissia in the second position on functional aspects but not the looks. This one resembles a tower model desktop with sleek and smooth surfaces, covered by a black color. Inissia is grey with a rounded top. Since it’s another Nespresso, you don’t expect it to fall below the espresso quality line. Due to its small size, it will fit in the smallest of spaces, and that’s great if your kitchen space is limited. Creating a suiting cup of espresso coffee needs the one-touch operation then wait for the 19 bars to deliver the required pressure. After starting it, the unit needs 25 seconds of water heating before it pours you a cup of concentrated coffee. If you don’t need an espresso, the programmable buttons allow you to switch from a 1.35oz espresso to a 5oz lungo. After three minutes of idleness, the machine decreases the amount of power consumed, and after nine minutes, it shuts off to save energy. Just like the Inissia model, you can only use Nespresso-based pods, but they include a starter package with 16 capsules in it. Another thing, if you love the taste of freshly ground espresso beans, this one might disappoint by not delivering what the taste buds are anticipating. 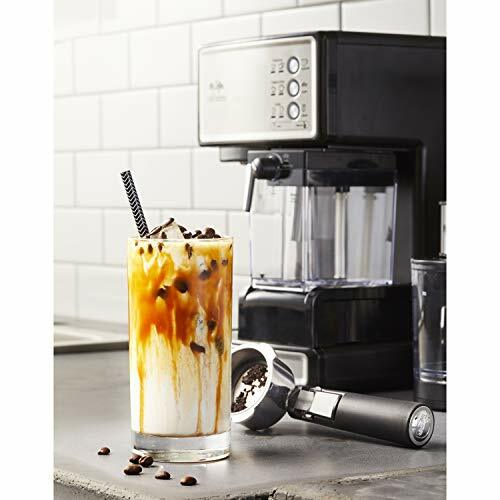 Inspired by the European cafes, Hamilton Beach 40792 Espresso Maker is another machine under $200 that will allow you to make espresso, lattes, and cappuccinos the way you like it. While the coffeeholics argue on the quality of delivered espresso from this machine, tampering the best ground espresso is what will determine the results from the 15-bar pump. You can make use of pods too if you don’t grind your coffee. Adorable features include a detachable water tank that will permit more drinks before refilling. Inserting the filter uses the slide and lock mechanism which most beginners will appreciate. If you are used to measuring your coffee via programmed buttons, this machine requires you to watch until the cup fills to avoid spilling. Some of us would consider that as a flaw, but it depends on preference. 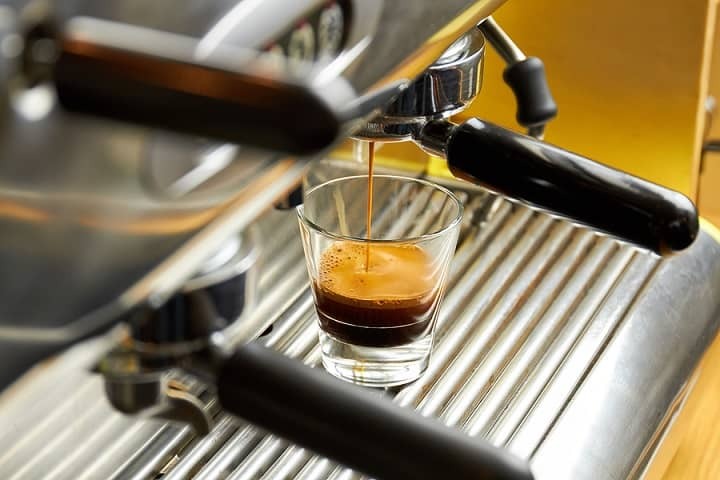 If you don’t want to make the stronger coffee, the espresso machine can also work on weaker coffee solutions. When it’s time to stop everything, pull the plug. After extracting espresso, it’s a good idea if you switch the dial to neutral, then wait for a few seconds before powering it off. A steam wand is present for you to froth milk if you are working on lattes or cappuccinos. It, however, may feel cheap since it’s plasticized. What’s more, is the cup warmer that keep your coffee within the right temperature until serving time. Nespresso again! The Vertuo Coffee and Espresso Machine bundle from Breville is another one of the small espresso makers. Just like the other Nespressos reviewed above, it’s all about one touch and waiting for the brewing process. On the downside, you need the Vertuo specific capsules for the job – a limitation also faced by the other models too. The reason why you will want this unit is the quality of espresso coffee delivered. First, the capsule rotates at 7000 rotations per minute after insertion, giving you the right crema for your coffee. If you don’t want the crema, just spoon it off after filling your cup. The patented Centrifusion Extraction Technology enables the rotation. Next, this machine detects the kind of blend in your capsule. The intelligence here involves reading the barcode on the capsule to know which grand cru matches the read selection. For those of us saying Nespresso machines don’t deliver the right espresso cup, this takes it a notch higher than regular espresso. You get the best-concentrated coffee after brewing the first 1.35oz. Other coffee samples include a double espresso at 2.7oz, lungo (5oz) regular coffee and alto at 7.7 and 14oz respectively. If you need the froth, the bundle consists of an Aeroccino 3 milk frother. After starting the machine, it will take 15-20 seconds for the device to heat. Lastly, the tank is 40oz so there is no frequent refilling especially if you only need to make espresso cups. 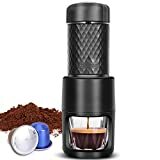 The last one on the list goes to a portable espresso maker that you can take it with you if you are such a coffee lover. It’s smaller than the Nespresso models to fit in your bag or tote. Travelers who need coffee on their way will find the STARESSO Portable Espresso Machine as an ideal solution. The patented pump delivers 20 bars of pressure using a force that is 50% less than what you get from more prominent espresso makers. After loading coffee and water, you have to give it a few pumps using the pusher at the top then wait for about ½ minute before pushing out one last time. Apart from espresso, you can also use to prepare mochas, Americanos, etc. using the extracted shots. The only limitation is getting more than one espresso shot. If you don’t grind coffee, it’s still okay since the machine is compatible with Nespresso capsules. What you get out this handheld device may not be comparable to how espresso should be. Why? The basket underneath holds a maximum of 10 grams of coffee. You also get better coffee when using hot water as opposed to cold. Speaking of water, the reservoir holds 80ml, and that’s why it suits as a traveling companion. You, however, need to carry more water separately if more people will be using it. Washing is easy since its dishwasher safe, but it gets cumbersome when trying to scoop the grounds out of the small basket. I appreciate the value of making real espresso coffee. If you are reading up to this far, it means that you are looking for an espresso machine that can deliver the same. Do you already have a choice in mind on what to go for? Clicking on the individual products will land you the right page to fetch it. Are you still confused? How about I recommend to you Mr. Coffee Café Barista to try it out? It might feel cheap if you look at the construction, but it will give you espresso coffee shots that will make you reduce the number of times you visit the coffee shop. You also have a choice to make other drinks. 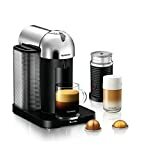 If you don’t grind your espresso beans, the Nespresso Inissia made by De’Longhi uses capsules, and there are many flavors to choose from the brand. Now, it’s time to go ahead and start your barista journey!